This is the final book Agatha Christie wrote, although it was not the last to be published. It is also the final part of the Tommy and Tuppence series, the rest of which can be found elsewhere on my blog, specifically here, here, here and here. As mentioned there, this series follows the exploits of married couple Tommy and Prudence “Tuppence” Beresford as they grow up and grow old, from their early twenties in the first book to their mid-seventies as they are now, making them the only Christie characters to age in time with the real world. These books are not murder mysterys so much as detective thrillers and spy stories, and while Christie is usually pretty good at whatever she attempts, but here … well, look, I’ll explain after a synopsis. In the fifth outing for Tommy and Tuppence, they have just bought a new house in the little village of Hollowquay and find themselves struggling with all the problems that come with moving house. There are electricians ripping up floorboards, a garden to tame, and people’s possessions left behind that need sorting. Tuppence takes a shine to a few boxes of childrens books in the attic and when going through some old favourites seeking out memories one day, comes across some red underlinings in one of them. The previous owner hasn’t, however, underlined whole words or phrases, just single letters. When added together they spell out a singular, unmistakable message: “Mary Jordan did not die naturally.” Not one to ever let a mystery pass her by, even in her advancing years, Tuppence begins asking around the village for anyone who may have known who Mary Jordan was. There’s no beating about the bush on this one – it simply isn’t very good. One has to remember that at this point Agatha Christie was eighty-two years old and even at the time the reviews were mostly negative. Sure, some people were happy with it, but others note that Christie was clearly showing her age. The characters and their conversations meander and repeat, and things that seem like they have easy answers take ages for the characters to sort out. Tommy and Tuppence seem to forget what they say to each other a few times, and there’s a lot of dialogue repeated before much action takes place. In fact, it’s actually been suggested that the style here is indicative of Alzheimer’s Disease, despite Christie never being officially diagnosed with it. Going, I think, a bit too far, The Cambridge Guide to Women’s Writing in English says that Christie has lost “her grip altogether”. Perhaps it’s intentional. Perhaps the fluffy, confused style of the novel is supposed to represent the aging minds of Tommy and Tuppence as they have less of a firm hold on their world. Perhaps these are just the thoughts of someone trying to convince himself that there’s no way Christie could’ve written a bad book. Truth is, while I think Christie was marvellous for a good many decades, at the end there, her age defeated her. She died three years later, having never written another book. The star of the book, incidentally, is the Beresford’s Manchester terrier, Hannibal. Portrayed as a hugely intelligent dog who, in the end, is repsonsible for saving the day and being a wonderful comic hero. 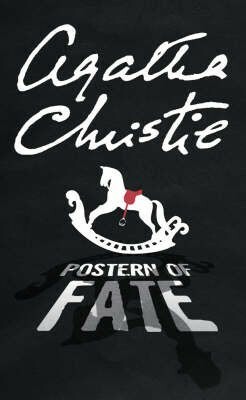 Obviously, it’s a shame that Christie’s skills had become somewhat less acute by the end of her life, but given that I’ve read about sixty of her novels by now and this is the only one I’ve come across that’s had me disappointed, I consider that a win. She had a sparkling, incredible career, and while this one might be more forgettable than some of her others, there’s no denying that she was one of the most talented wordsmiths in history and we were lucky to have her for as long as we did. The Queen of Crime, long may she reign.